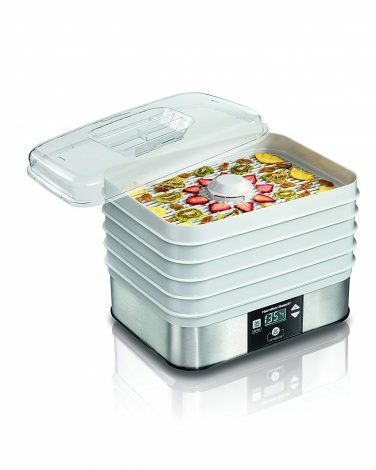 It is a five-tray food dehydrator that dehydrates your food quickly in a few hours. It runs on the power of 600 watt that provides maximum power for drying food. Its top mounted fan helps in rotating the heat evenly on all trays of the machine without mixing the flavors of the food. You can adjust its temperature easily between the ranges of 90 degrees F to 160 degrees F according to the type of food you want to dehydrate. There is no need to do the rotation of the trays while drying foods in the machine. The best part about this food dehydrator is that it has an opaque exterior that stops the harmful lights from entering the machine. You get one recipe book, two mesh sheets, two solid sheets and three packets of jerky spice with the product. The unit is expandable up to 12 trays with the optional Add-A-Trays. 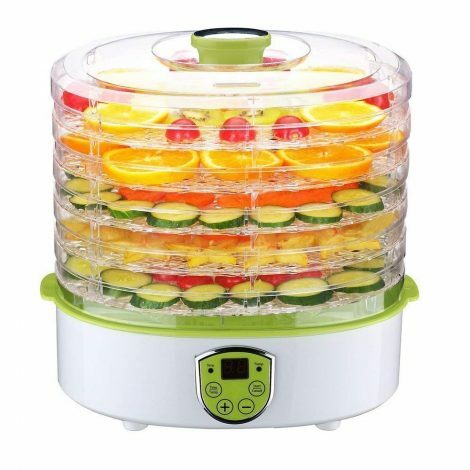 The Hamilton-beach 32100C is one more incredible food dehydrator in our list that comes with five stackable trays. It possesses drying power of 500 watts which is adequate for dehydrating any type of food. Moreover, the manufacturing company also offer five years limited period warranty along with the product to the buyer. You can adjust the temperature of the machine between 100 degrees F to 160 degrees F with the help of digital thermostat. There is a 48 hours timer in the dehydrator that comes with the feature of automatic shut off. The constant flow of air offers uniform drying of the foods, and you don’t have to rotate trays during the process of drying also. It helps you in preparing the healthy recipes of fruits, jerky and veggies without adding any preservatives or chemicals. You get one fine mesh sheet for dehydrating small size foods like herbs and one solid sheet for preparing fruit rolls. With the help of its clear lid, you can check the progress of your food quickly. 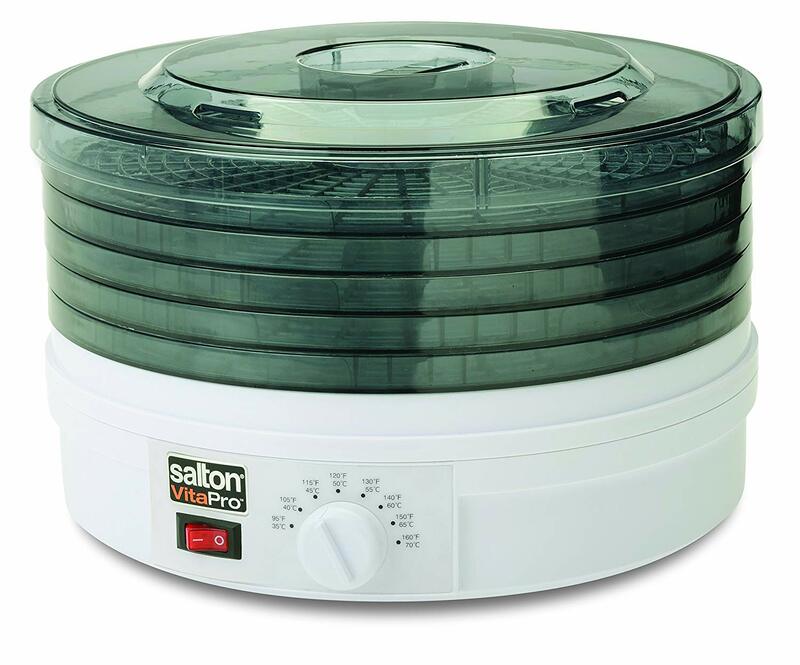 The Excalibur 3900B food dehydrator has an inbuilt ON/OFF switch as well as adjustable thermostat whose temperature ranges from 105 degrees Fahrenheit to 165 degrees Fahrenheit. You can safely dehydrate jerky meat in it also. The components like a heating element, 7-inch fan and adjustable thermostat located at the unit’s backside for uniform distribution of the air over all the trays. The Hyperwave Technology and Horizontal Parallexx Airflow help the machine in drying faster along with the retaining of more nutrients. There is no need to rotate trays in the machine during the drying process. It has nine easy to clean poly-screen trays that offer drying space of 15 square feet for foods. It runs on the wattage power of 600 watts. In this food dehydrator, you get the feature of adjustable temperature control for drying several kinds of foods at the right temperature. There are five stackable trays in the machine for drying. It can expand 30% for the foods that have thicker constancy. It does fast drying between the periods of 4 hours to 8 hours without using the adjustable thermostat feature. It gets disassembles easily, and you can wash it’s all removable components in the dishwasher too. 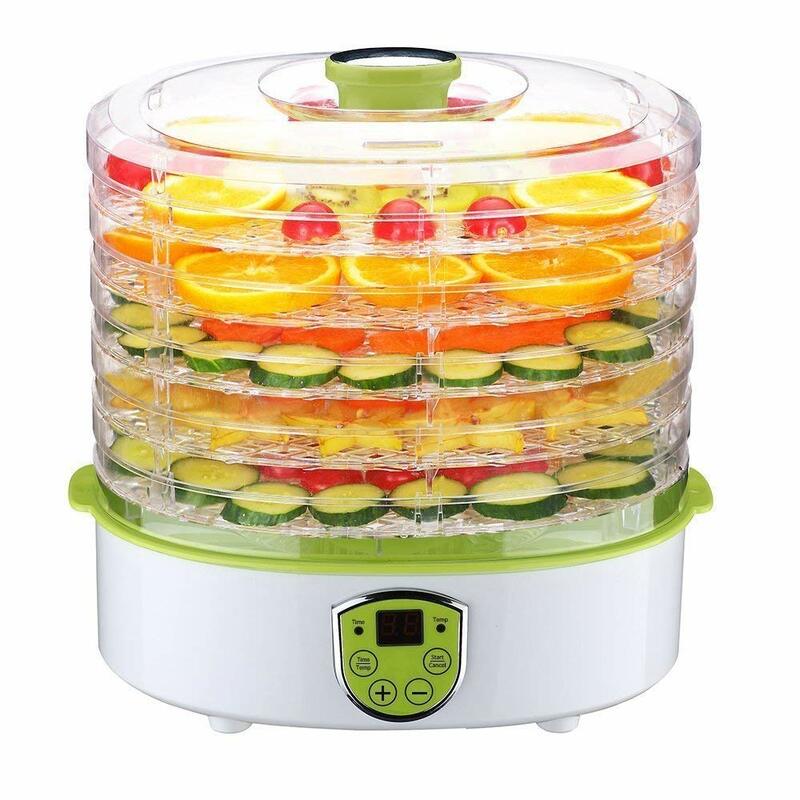 The best part about this food dehydrator is that it is a BPA free product that does not produce harmful chemicals while drying food at high temperature. You get one herb tray, recipe booklet, instruction booklet, and one fruit roll-up tray along with the product. The powerful fan and motor move the air for uniform drying without the need for tray rotation. With the help of the transparent trays, you can check the status of the foods that you can dehydrate in it. It has a digital display that comprises of an adjustable thermostat of 35 degrees Celsius to 70 degrees Celsius and a 72-hour timer. It dried out the food evenly from all sides with the help of superior flow of air that provides good flavor to the food as well. It removes the moisture out from the food without the loss of flavor. You can make natural, healthy snacks in it like fruit roll-ups, kale chips, and beef jerky. Thirty-five degrees Celsius is a default temperature setting and 8 hours is the default working time of the machine. But you can adjust the temperature and time as per your need. It is made from food-grade ABS plastic material so that you can dry out your food in the healthiest way. All the controls of the machine are easy to use and operate. The machine gets off as soon as your drying process gets over. The main highlight of this food dehydrator is that you get a lifetime warranty with it. Food dehydrators not only help you in drying your food but also benefits in holding all the essential nutrients and minerals inside the food. 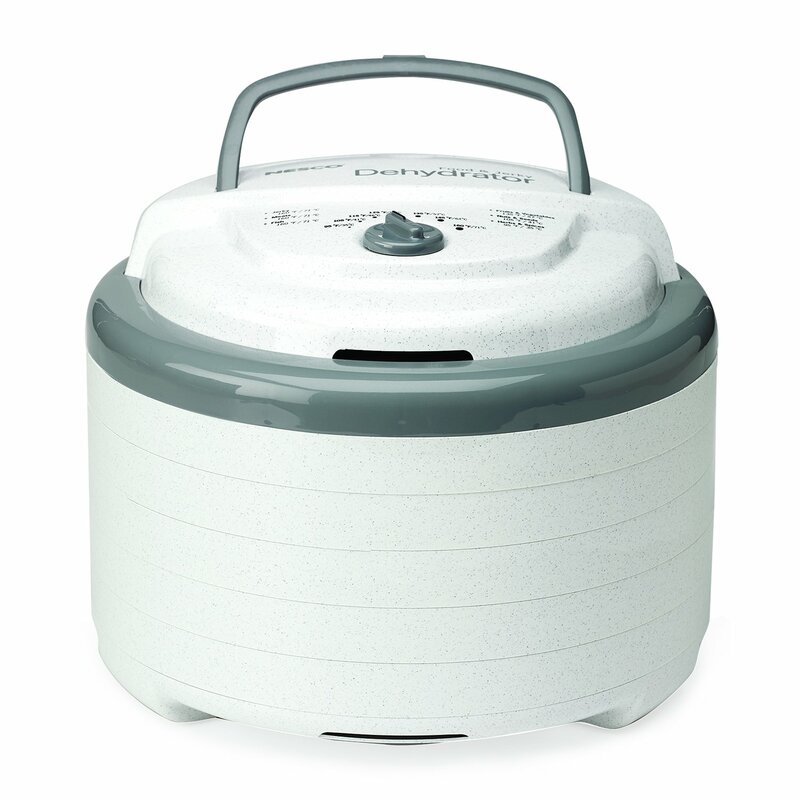 There are so many different types of food dehydrators in the market that you can find today. But it is you who have to decide which food dehydrators you need and why. In the above article, we have reviewed the five best food dehydrators of Canada along with their pros and cons. All of them are incredible to buy. 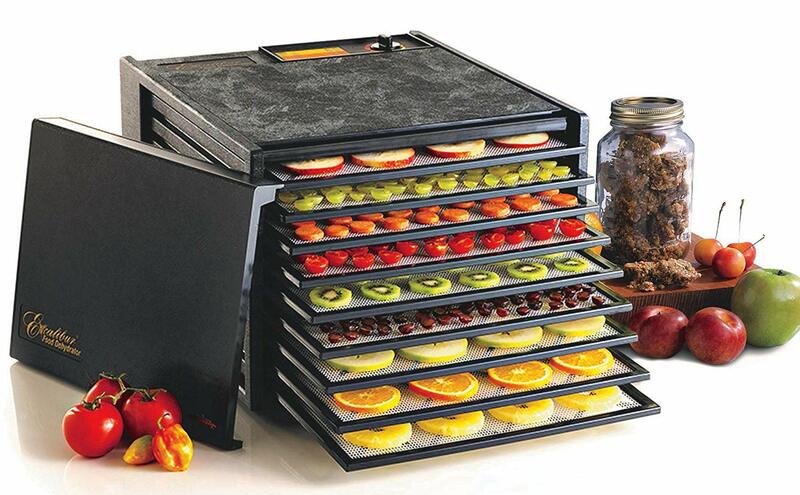 But we know there is only one food dehydrator that has won your heart. So, make your decision wisely about buying the food dehydrator after keeping in mind your needs, budget, and requirements. A right food dehydrator can make a big difference for your pocket too. Your right investment will provide you the perks of the dehydrated food for the lifetime. So, it’s winding up time of our article. Please let us know which food dehydrator from above list you pick and why. You can also share your kind thoughts on the above info in the below comment box too.